Style and trend take on many different shapes and forms. The beauty of architecture is how many options there are out there, which means that depending on your personal preferences, you can end up with a very unique yet incredible home. Today, we will see how wood and brick have been used together in house, designed by professionals DCK, to create a fabulous exterior and a very savvy interior design. We will also see how these materials have been used in new and innovative ways, for incredibly aesthetically pleasing results. The great thing about wood and brick is how they bring a warmth and a homeliness to a space, allowing cutting-edge design and a sense of coziness to collide. 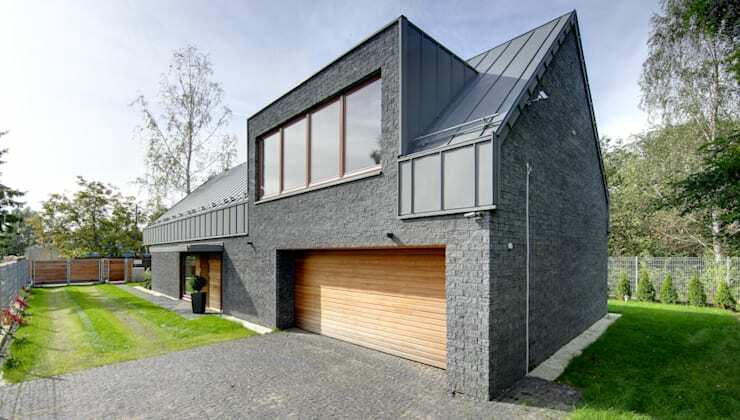 From the front of the home, we can see that it is a very modern and contemporary structure, with a grey brick wall giving rise to a unique metal roof, which brings a bit of an industrial look and feel to the space. 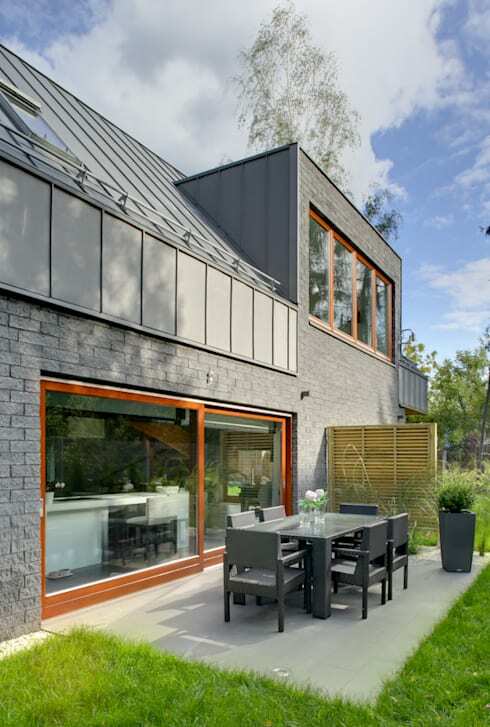 They grey tones are complemented by the wooden garage and wooden front door, which break up the monotonous tones. Windows are featured on the second floor, allowing sunshine to flow into the home. In this image, we can see how a garage plays a big role in a family home and its design, neatly finishing off the look and feel of the facade. It is functional too, keeping vehicles and other storage items neatly out of sight. If we make our way to this side of the house, we come across a very interesting design. The architects have truly played with the space available to them. The upper storey of the home features wooden cladding and looks like a traditional barn or log cabin, yet it extends over the bottom floor, which is made up of the grey brick. 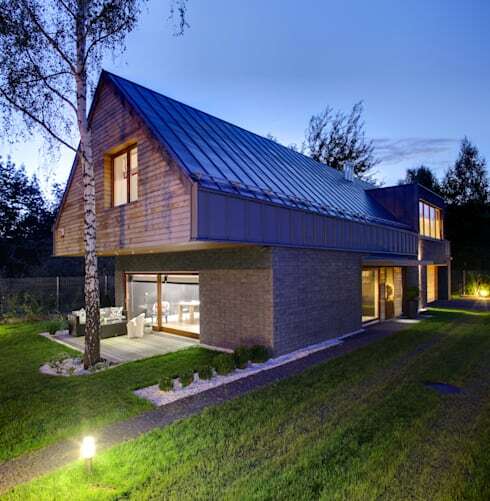 This is a very striking piece of architecture, which fuses two styles together in quite a daring statement. Yet the designers have pulled it off, using the materials to complement and enhance one another. The added advantage is that they have also created a covered terrace, which fits into the design of the home like a puzzle piece. If we look at the terrace a little bit closer, in daylight, we can see that it is made up of a wooden deck and some very comfortable looking terrace furniture including an outdoor sofa and coffee table. This creates the perfect spot for relaxing outdoors in the sunshine and fresh air, while still being shaded thanks to the extended wooden ceiling. The wood from the ceiling and the wood from the deck also contrasts wonderfully with one another, ensuring that this outdoor space feels like a little cozy nook. Couldn't you imagine reading your book out here while enjoying the surrounding greenery? Tip: Add a few pot plants or flower beds to your terrace as a natural form of decor. The entrance of the home is one to take note of because an entrance is incredibly important to the design of your home. It is the first impression that people will get and you want it to be warm and inviting. This is exactly what the designers have achieved here by firstly creating a functional paved pathway that leads up to the front door. You don't want anyone tripping in the grass! Secondly, they've opted for a dark wooden door, which contrasts with the light wooden cladding. Wood is warm and earthy, immediately creating a sense of beauty and comfort. A pot plant on the right adds a subtle yet beautiful final touch to the design, while the large glass window on the left allows for a little peek into the home. On the side of the house, we come across another example of how the living area has been extended to the outside of the fabulous home in the form of this outdoor dining space. This area isn't covered so it may need an umbrella or a gazebo at some stage, but otherwise it is simply perfect. The grey table and chairs ensure that it works in harmony with the architecture itself, while a bamboo wall protects it from view. Thus we are left with a secluded little space where family and friends can enjoy meals in the sunshine or under the stars. A vase of flowers on the table completes this look and feel. Tip: Opt for durable furniture that will last in all weather conditions for these kinds of spaces, especially if they are not sheltered. Unfortunately we only get one little peek inside the home today, but as we can see it is not disappointing! The designers have gone for the same grey and wood tones, with a very surprising and striking design! In the open plan home, there is a fabulous wooden staircase that spirals down from the second floor, seemingly flowing like water through the air. The glass railing enhances this incredibly beautiful feature, while reminding us how easy it is for function and design to collide. The natural light that flows through this space further enhances the design, making for a bright and beautiful interior space. 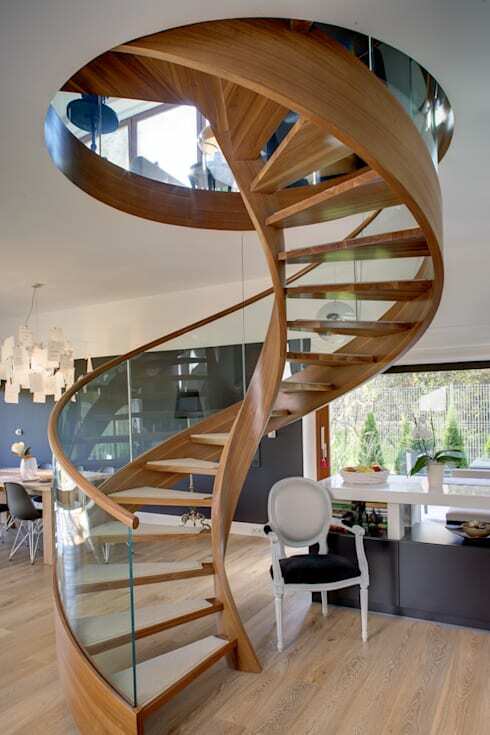 Also have a look at these awesome spiral staircase designs for inspiration. What do you think of this wood and brick home? Comment your thoughts below!